WHEN it comes to making ice cream, Philip Mancini takes some licking - and to prove it he has been officially crowned the ice cream king of Great Britain. Philip swept the board at the national ice cream competition run by the Ice Cream Alliance, collecting five trophies including two champion of champions trophies. The Mancini family has been making ice creams for 96 years, and Philip used the skills handed down through three generations to melt the judge’s hearts. “To make great ice cream you need passion and dedication to ensure your product is so much better than anyone else’s,” said Philip, whose family business has been based at the Royal Café, New Road , Ayr since 1925. “To me, ice cream should have a silky soft feel that melts in the mouth with flavours that light up your taste buds. The Mancini ice cream business was started by Philip’s grandfather Antonio in 1913 and Philip is the third generation to run the business, and he is hoping his son Mark, who helped make the award winning chocolate ice cream, will become the fourth generation in the business. Philip has worked in the business since he was a boy and when his father, Michael, retired in 1991 he took over the business with his sister Anna. “We are very lucky to work in such a wonderful business. People love ice cream and no matter what the Scottish weather is doing people still want ice creams,” said Philip. Philip’s haul included trophies for best artisan ice cream, best chocolate ice cream, best mango sorbet and a double champion of champions win. 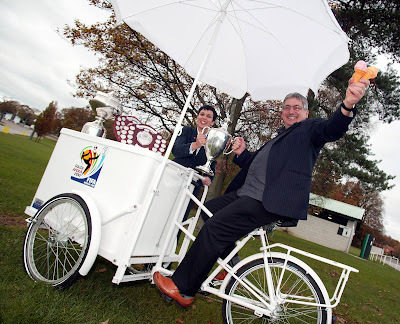 Zelica Carr, chief executive officer of the Ice Cream Alliance, which runs the competition, said: “To win five trophies is a truly outstanding achievement by Philip and his family. They were up against extremely strong competition but their ice creams were exceptional. The ICA has long established links with all Government bodies, particularly DEFRA and the Department of Health (DoH) and is continually involved in putting forward and supporting the views of its members. Incorporated in 1944, and formerly known as The Ice Cream Association of Great Britain and Ireland, the ICA provides an ever-developing forum for suppliers, retailers, caterers and manufacturers of ice cream products. There are currently 614 Ayrshire business stories permanently archived on this site. To locate those of most interest to you, please use the site search facility in the top left hand corner of this page. Type your search term in the white box, then click “SEARCH BLOG”.